2018 Waves of Change “Team Leadership in 48” retreats are tentatively planned for Texas and Maine. We are seeking locations and sponsorships. • Attend and participate in the mid-year event. • By the time a series is completed, individual members must have identified a leadership role to pursue at the local, state or national level and an accountability partner. • Members or chapters are responsible for funding individual transportation to the retreats. (This may change based on sponsorships, scholarships or incentive/refund options). This will be a combination of short vignettes, 1-2 hour “Deep Dives”, webinars, and assigned readings/discussion topics delivered or facilitated by AAW members and sponsors who are considered subject matter experts. Webinar topics can change annually, thus all members can continue to engage in learning and development via the live or recorded webinars. 1. 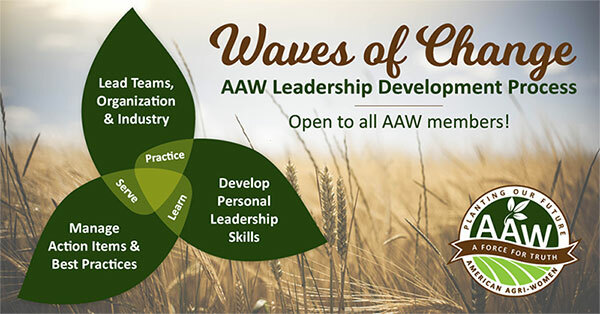 Members serve by LEADING teams on the local, state and national level to accomplish strategic goals of AAW, the annual Rallying Cry (such as Ag 365 in 2017), and goals of the agriculture industry. Practice at the local level prepares members for bigger roles at the state and national level. 2. Members DEVELOP, practice and learn personal leadership skills at the local, state and national level to fulfill their leadership roles and advance within the organization and the industry. 3. Members MANAGE action items and learn best practices to ensure that AAW serves its purpose and moves forward with a shared vision that is communicated and achieved at the local, state and national level. All members know who must do what to succeed.